Welcome to the final day of guest bloggers on the Modern Plus Sign Book Blog Hop. I had the absolute pleasure to be part of this hop. 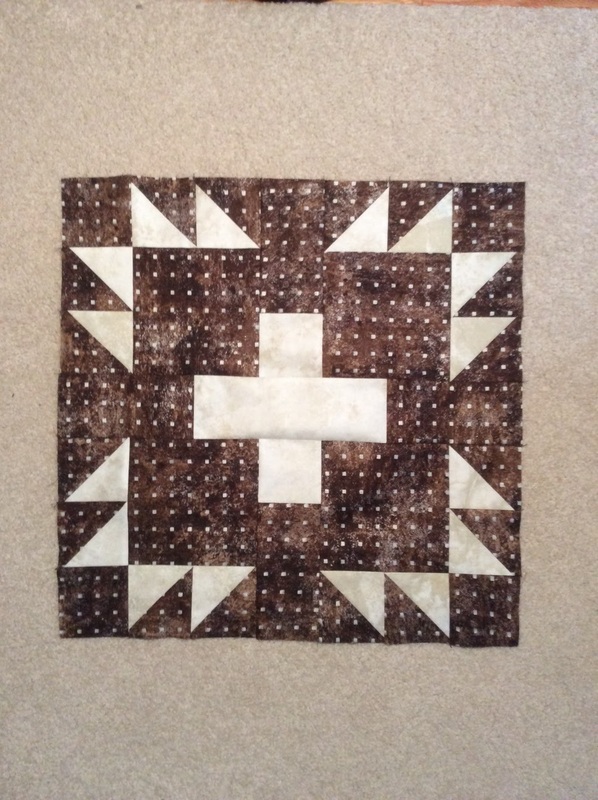 The first part of my quilt was what I called the dark block. A plus sign in the centre of a bear paw. I wanted my fabric choices to be somewhat masculine and thought of black bears and grizzly bears when I was scouting my stash for something suitable. If you missed the first week of the blog hop and have time to visit the bloggers who highlighted the first patterns shown from the book here is a list that connects directly to their blog post. The second component is one I call the light block. 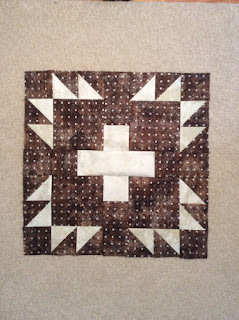 Again a straightforward, no issues quilt block. The book is well illustrated and the directions are very easy to follow. 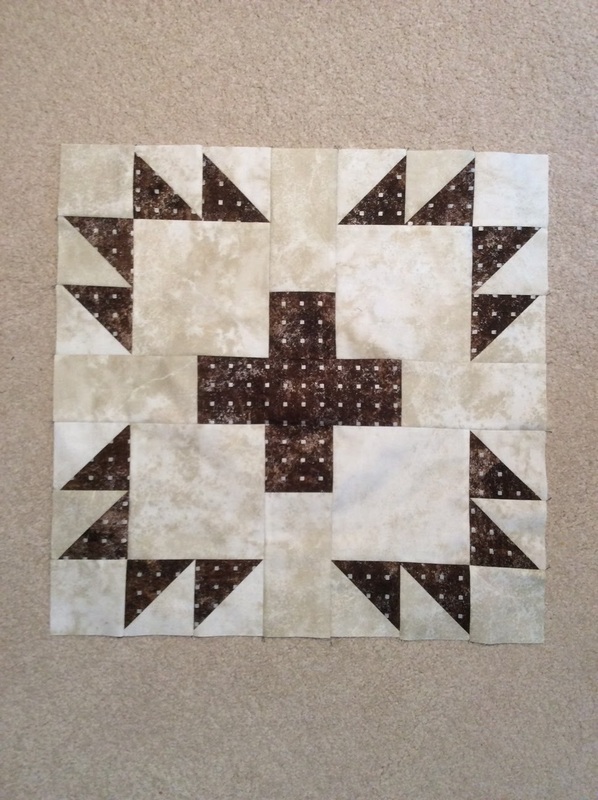 The end result when the two blocks are combined is this lovely Bear's Paw Plus Quilt. 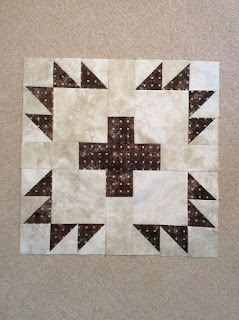 It is so nice to say this quilt is finished and once the blog hop is over will reside on my hubby's easy chair. He has needed a new quilt for some time and this one is just the ticket. Here are the links for this week's Blog Hop participants. I don’t see many browns just now and this makes a refreshing change. It’s a lovely combination and a great man’s quilt. You made a great job it’s wonderful, a great version I may just have to copy. Thank you for sharing. Great version of this quilt, Joanne. I love the masculine feel and your colour choices definitely bring the woods to mind! Joanne, your contrasting neutrals are lovey and perfect for guy's easy chair. The dot is so fun! I didn't see it before, but the block is spaced nicely for grid quilting and I love walking foot quilting! Thank you so much for joining the hop! Great version! I love the brown prints and you have a very lucky husband. Thanks so much for being a part of the hop! This make so much sense--bear paws=brown. 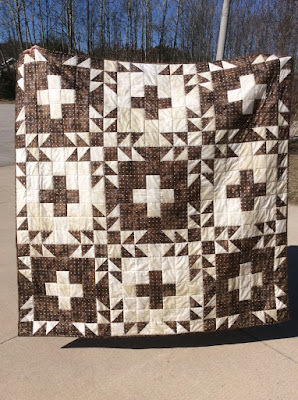 A great DH quilt! Oh this is a perfect man quilt! Your husband is a lucky guy! I love how your fabric choices look with this pattern, it really is perfect for a man quilt, and that's hard to do! Beautiful finish! How awesome that your husband is going to get a new quilt to enjoy. Your version is striking! Love this design and your quilt is perfectly manly!! It's so pretty in these two alternating colors. This might be my favorite plus setting. Really pretty! I like the light and dark pattern. It's stunning and wow what a great guy quilt. Great quilt! The alternating dark and light blocks really make this design interesting. I hope your hubby enjoys his new quilt. This quilt is fabulous! Love the dark, masculine browns that give so much contrast to the white so the bear paws really stand out. Great job! Very lovely. I just may need to make one like it for my husband. This is so right for your man, and the lines of quilting perfect with those fabrics. I am sure he will be thrilled to have his own. It does look like a great quilt for a guy. Sometimes it's hard to choose fabric that a guy would like. Well done! This looks great! I like the brown as I, too, associate bear paw blocks with brown. So glad it will find a home in your home! Beautiful quilt! I love the simple, masculine feel of your quilt. It is beautiful and very nicely done. I got the book before the block hop but I am really loving seeing all these different versions of quilts. Your brown bear quilt looks so cozy and I think your husband will love it. Your version looks so warm and cozy and like it'd be perfect over an easy chair. Hope your hubby enjoys it. Great job! Your quilt is so nice. 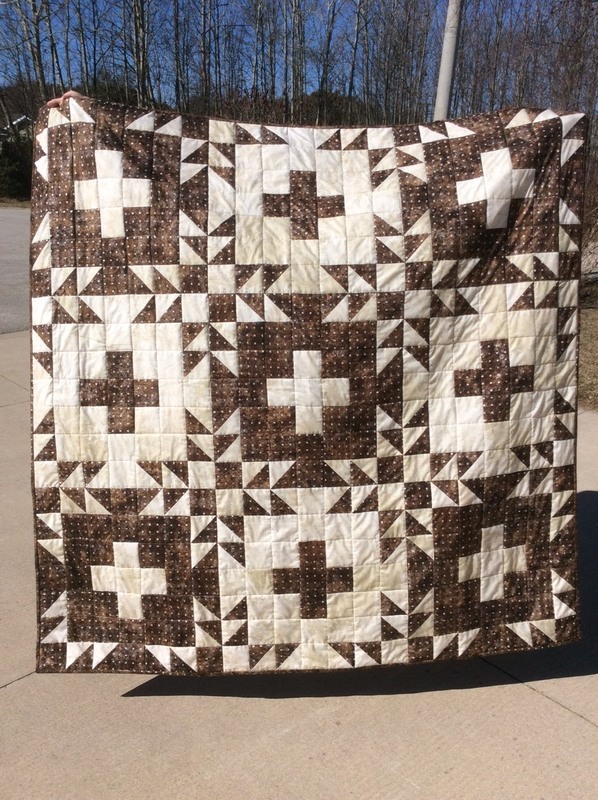 Were you thinking of brown bears as you were making this bear paw plus quilt? It is nice to see such variety on this blog hop. This was a challenging pattern and you slayed it! Your brown bear sure has some sharp pointy claws. Very nice work. Yay for a quilt for the husband! Mine gently asked me last week about 'his' 'Aren't you making me a quilt with those skull fabrics?' This one will be a great guy quilt! This is a really striking version of this quilt - great for a man and so glad to hear it is already in use! This is such a wonderful quilt. Great job!